Hanging Tealight / Votive Candle Holder by CYS EXCEL - Teardrop Plant Terrarium - Multiple Packing and Sizes (5.5 in (Pack of 48)) by CYS EXCEL at Tulips Orchids. Hurry! Limited time offer. Offer valid only while supplies last. 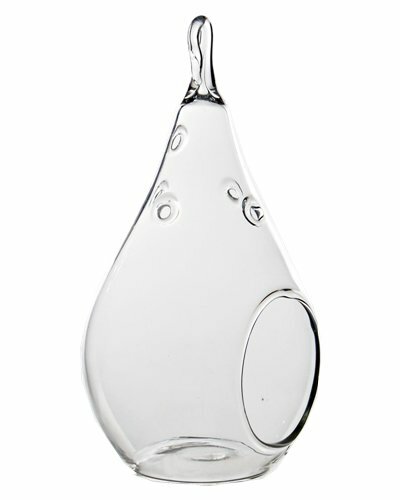 Plant Terrarium Glass Containers, Tear Drop Pear Shape Terrarium Glass. Dimension - Height 5.5 inches, Body D-2.75 inches, Wholesale Pack of 48 pcs. Plant Terrarium Glass Containers, Tear Drop Pear Shape Terrarium Glass. Dimension - Height 5.5 inches, Body D-2.75 inches, Wholesale Pack of 48 pcs. Made of Clear Glass, Terrarium can be sit on flat surface. The hook on top is for Hanging Terrarium Purpose. Perfect terrarium container for planting succulent, air plant and cactus.